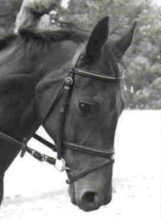 Near the end of the show season of 1996 I went through some confidence trouble with my old horse Promise. At the time I had just moved up from 18" to 2'6". This is a big step and I took it way too fast. My first advise is: Don't ever ever push yourself to fast. (I did. I regretted it.) What I did was called 'dropping' her. It's when you put your weight on your horse's neck by placing your hands down in front of a fence. I was afraid of the fence and I didn't believe that Promise could make it over even though I knew she could. I dropped her. Our confidence and trust in each other was shattered. She stopped at almost every single fence I pointed her at. I finally realized that I had pushed myself too hard and fast. I started jumping 18" fences again. We went back and corrected the mistake. We had to do it by taking 2 steps backward in order to take 1 step foward. My second piece of advise: Go back. Don't continue doing something you are afraid of. Return to something comfortable and work foward very slowly again. The next year we were doing 2'9" at home and 2'6" at the shows with no problems.